Thoroughly familiarize yourself with the following dog training tips before you begin training your Miniature Schnauzer on dog obedience or any other dog commands, or dog tricks, as you will be using them throughout the entire positive reinforcement training process. Timing - Timing is key when using reinforcement training. The reward must always occur immediately following the desired behavior otherwise your Miniature Schnauzer may not associate the reward with the proper action. Treats - Be sure and keep a fresh supply of very small and moist or soft dog chew treats on hand, for reward. The moist and chewy dog treats are best to use because your Miniature Schnauzer will gulp them down and look up at you for more - ie. ready to perform for you again. As opposed to hard treats (like cookies or biscuits). These treats take time for your dog to chew. Not to mention, when he's finished he will waste time searching for crumbs on the floor. I use Zukes Mini Naturals Tender Chicken Treats - they are tiny treats (about a 1/4 inch round) and have no preservatives. Praise - Use verbal praises after each successful attempt your Miniature Schnauzer makes to perform a command. This is important because you will want to slowly wean your Miniature Schnauzer off always expecting a treat and your Miniature Schnauzer will be just as happy to hear GOOD BOY! Repetition - Dogs learn through repetition. But don't try to get your Miniature Schnauzer to learn too many dog tricks at once. If you plan on spending an hour a day training your Miniature Schnauzer, break the training sessions up into 15 minute intervals, four times a day. This will make each dog training session much more fun for both you and your Miniature Schnauzer. Tone of Voice - Your dog training sessions should be fun BUT the tone of your voice, during commands, should be firm and authoritative. Use a slightly louder and deeper than normal tone of voice, when giving commands to your Miniature Schnauzer. When you say... COME ...mean it. And when your Miniature Schnauzer complies, praise him using a happy, light, and somewhat excited tone... GOOD BOY! Distractions - Your dog training sessions will be more successful if you find places where distractions are few. Introduce distractions during your training sessions only after your Miniature Schnauzer has mastered a command. dog training distraction example: You don't want to begin practicing the command 'STAY' with your Miniature Schnauzer in the backyard knowing there's a squirrel out there jumping from tree to tree. The more you practice the skills of dog training, the better you will become as a dog trainer. The above dog training tips will help you achieve your goal with your Miniature Schnauzer. 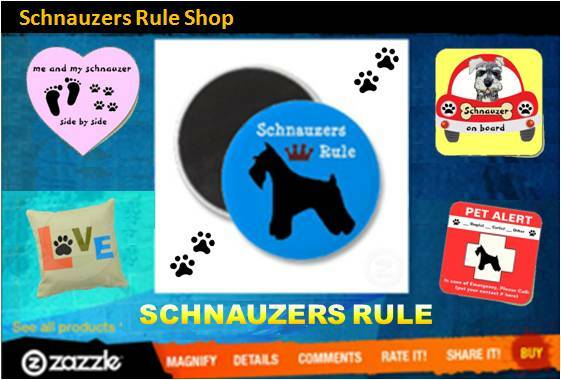 During your training sessions, you will quickly learn what motivates your Miniature Schnauzer to respond favorably. And in the end, the better trained your Miniature Schnauzer is, the better relationship the two of you will share. For a dog who learns to perform tricks, is a more well-behaved dog overall, making him a joy to have in your life.